It is not easy to be the parent of a child on the Autism Spectrum. Parents worry themselves sick, fight for services, sacrifice careers, sink into debt, and rage at the injustice of it all. Parents of children with ASDs may feel down more often than most. 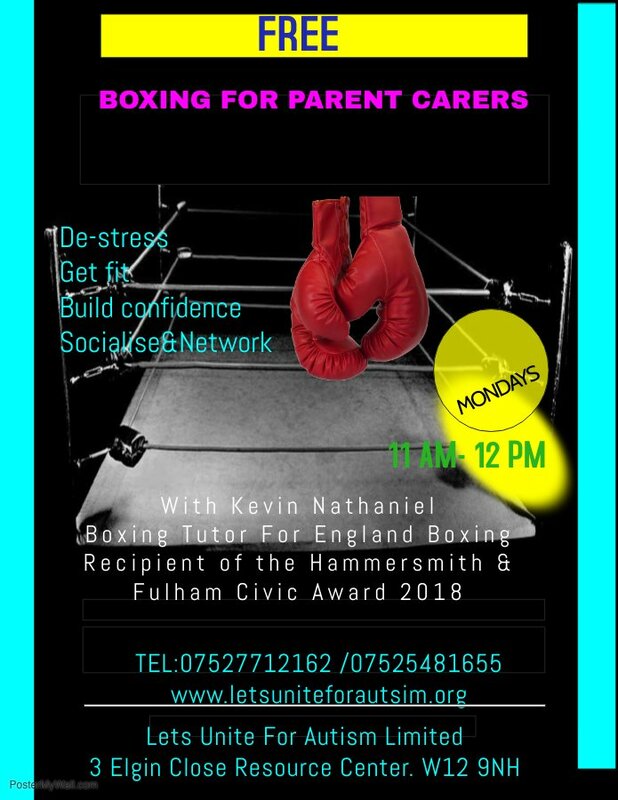 Our active sessions for Boxing with a professional well-known and recognised boxer will help parents beat the anxiety, reduce stress levels and improve the general health and wellbeing. Parents need this outlet to function and it has also been noted how physical activity increases well-being and beats depression and stress. Enhanced Cardiovascular This cardio exercise helps to protect yourself from heart disease, burn calories, and lose or maintain your weight. Please view our Boxing Fit Leaftlet! Youth worker and coach at London Sports Trust. He works for London Sports Trust and his Boxing tutors’ licence is from England Boxing. Boxing Tutor for England boxing.